I have a Britteny bird dog. We have not had a good seasoning of bird hunting out here in the West because of the drought. I took the dog to Idaho and he did great, Pointed on chucker and Huns. I was very pleased with his hunting ability. I hunt quail out here in the west. This year the birds are back. Several times my dog has passed live birds hiding in the brush. I just don't get it. Sometime I wonder if he has a nose. Like I said earlier he did great in Idaho. He has pointed some quail. My other Brit that I had would point all of the time, he rarely missed any birds. I know all dogs are different, but this seems to happen a lot while hunting quail. Has anybody else experience this. Question, is he on the wind side of the bush when he misses the birds? Probably was on the up wind side. The dog has already shown he'll point birds. First time on quail he might have bumped them if he'd smelled them but I doubt he'd have passed them. On the up wind side they can pass awful close and not smell them. Keep running him. Valley quail are very difficult for a dog...when you are hunting Chukars and Huns you are getting better breezes off the ridges. 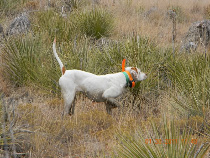 In my experience it takes a dog awhile to get the valley quail thing down especially in the sage country. I have watched wild birds numerous times run back between dogs and I ... it takes some experience. They are a little like wild late season pheasants. Don't give up, keep the wind right and the dog will figure it out. The desert scent conditions are not great alot of times either because of the lack of humidity. "The wind is a dog's friend." Thanks for the information on the dog pointing ability. It Justs seems that the dog passes a lot of birds while we are hunting quail. I hunt quail mostly out here in the West. The first two years I had the dog the bird hunting was terrible because of the drought. Hopefully he will pick it up soon. There is nothing like a dog on point and a bird comes busting from the brush. I find that at good quartering pattern will help when hunting quail. If the dog has a good nose, quartering will put the dog on the down wind side. Thats good advise but the terrain does not always allow it. Where I hunt its very steep and rugged. You really need to watch your step. Those birds no the game. I think you may just have a conditioning problem. You said the terrain is difficult. Dogs breath simultaneously through their mouth and nose. This allows them to scent while they are running. When a dog goes into oxygen debt it only breaths through its mouth and loses the ability to scent. Fit dog = more birds. Good luck. 4dabirds wrote: I think you may just have a conditioning problem. You said the terrain is difficult. Dogs breath simultaneously through their mouth and nose. This allows them to scent while they are running. When a dog goes into oxygen debt it only breaths through its mouth and loses the ability to scent. Fit dog = more birds. Good luck. Great point. A panting dog is not a "scenting" dog. It's made even more a problem in poor scent conditions. Without actually seeing your Brit hunt, this is very hard to answer. However after the dog has more experience he may develop into the wild Quail dog you want. However you also may have had an exceptional Brit before, and this particular dog may not be of the same talent. It has been pretty well documented that th best dogs miss 25%. And that doesnt say anything about scenting conditions on any certain day. I hunt blues and bobs here in far western Oklahoma along with pheasant and I have been having the same problem even with seasoned dogs. It is just to dang dry here as well. Not just the vegetation is dry but the ground underneath the vegetation is completely dusty and dry. always scented and found birds for gunning and the new dog passes scent in the same type areas, then there is a difference in the dogs abilities. However its true, the dryer the habitat the more difficult the scenting, we have been lucky here in Pa its been wet, cool and wonderful this season.